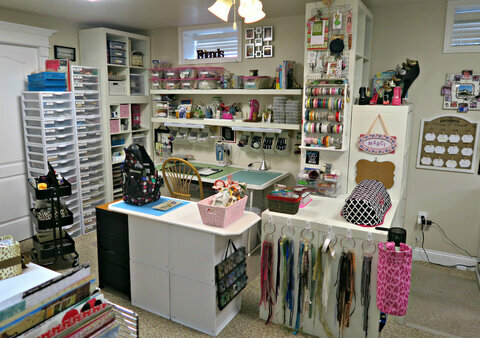 Location: Forum Index » Scrapbooking Forums » General Scrapbooking » Storage: bespoke, purchased or up-cycled? I've been looking longingly at Tiffany's ingenious storage and organization products and wishing I could afford the shipping to bring them to me in the wilds of Western Canada. I've also been wondering what other folks who've been scrapbooking for over a decade use to keep their stuff organized. 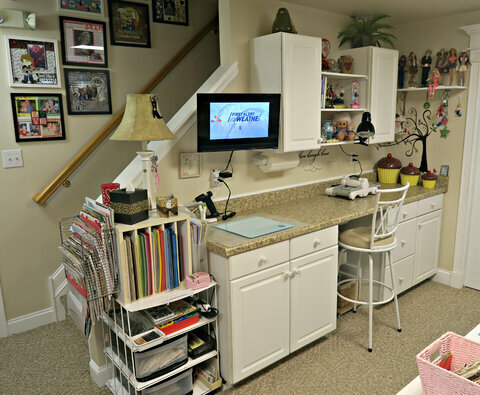 Do you have a custom-built (bespoke) scrap room, with storage designed for your specific needs? Have you purchased your storage units (from Ikea, Michael's, or online)? Do you re-purpose or upcycle old boxes and containers, or items meant for storing other things? Most of it's Ikea. My husband built the shelving to the left of the french doors. Some of the shelves were made to fit Ikea cardboard boxes. My room is wherever I can have it. 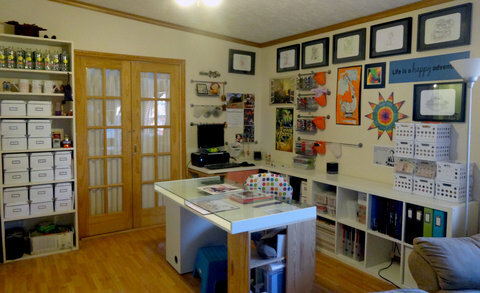 When we moved here I was in part of the family room and now DD's old room has become my craft room/guest room. I have shelves with 12x12 Iris drawers and other storage compartment pieces. I still use the same and I also use baskets, tins, and other containers that I already have or purchase. I might have a pic or 2 in my gallery. I currently have 3 but that will go back to two when Finn & Rosie go home. I have blankets and foam pads everywhere now. My puggles can hang out wherever they feel like. Mine is like Mrs. Miller . . . only not that pretty or organized. But lots of IKEA everywhere. I have a bigger desk that my husband built so I can have lots of room plus do my job at my computer. I spend a LOT of time at that desk. My storage is all mish mash. I go to garage sales, repurpose packaging, make my own stuff out of whatever I have. I make small drawers out of cereal boxes. Mostly I just make do. Ikea nor Martha would like it here, but I bet Lindsay would love it. Edited by don1 on 03-03-19 08:31 AM. Reason for edit: No reason given. Like Don1 I repurpose everything. Nothing matching. I use the money to "re-invest" in my hobby. No dog beds but my cat loves to lie on my paper. I dont really have a room just a unfinished part of the basement, nothing matches, no one can see the room as it does have a door on it.